BEST STOCK OPTIONS and NIFTY OPTIONS TIPS of INDIAN STOCK MARKETS from the most tusted GURUS !! : How you are loosing your hard earned money to the broker ? How you are loosing your hard earned money to the broker ? Just few days back I shared with you 20 reasons as to WHY I moved from my old broker to ZERODHA ! Incase you too are fed up with your current broker Click here to Recall and move to the best and the cheapest broker in INDIA ! Now I am more than happy to have opened my account in Zerodha and saved my brokerage upto 90%. Hurray see the following example in the image below. 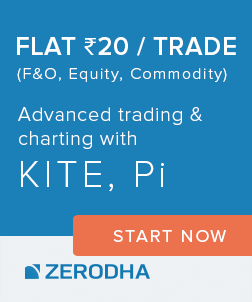 Check with Zerodha Brokerage Calculator Now yourself ! 1. I have bought Two lots (Qty-100 each lot) of nifty Call at Rs 152.43 (Paid brokerage of 134.67). 2. Squared OFF the position at 164.83 (Paid brokerage of 451.54). A total of Rs 586.11. 3. 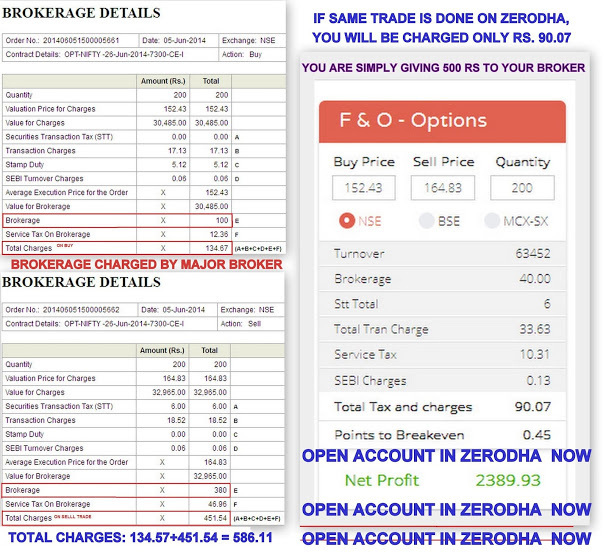 Now if same trade is executed in Zerodha Account, I have to pay Rs 90.07 only, Saving of Around Rs 500/- in a single transaction. 11. Trading, charting, and analysis, all rolled into one next generation desktop platform Pi.